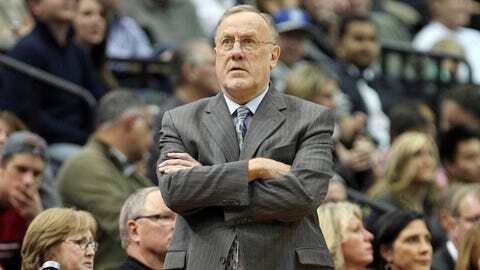 Minnesota Timberwolves head coach Rick Adelman looks on during the second half against the Miami Heat at Target Center. MINNEAPOLIS — Let them learn. Minnesota’s near-disastrous start Wednesday against Philadelphia didn’t just give the Timberwolves a chance to erase a large deficit for the first time all season. It granted a window into one of coach Rick Adelman’s central philosophies. During a 20-3 run in which the 76ers plowed through a sieve-like transition defense and benefitted from a bevy of missed layups, Adelman refused to call a timeout. Instead, he stalked the sidelines with his palms frequently turned skyward, at times sitting in disbelief, others railing against the officials — which he seems to do more of than anything else during games, save for crunch time. Maybe against a Western Conference power like Oklahoma City or San Antonio, he’d have given his players a chance to reset. But against a struggling team in a struggling Eastern half of the league, he sent them the message there are going to be times when they’re on their own. Wednesday, Minnesota did, outscoring Philadelphia 86-60 during the final three quarters and going ahead for good via a 10-0 run. The Timberwolves hadn’t rallied back from a deficit of less than five previously this season. Perhaps a timeout late in the first quarter would’ve staved the Sixers’ momentum. Made things easier. But for a still-gelling team that’s 11-11 with a loaded West standing between it and the postseason, easy isn’t going to be commonplace this year. Especially a bunch whose starters play a combined 169.6 minutes per game — fifth in the NBA — while the bench has been mostly a sore spot. Although they’re young, the Timberwolves aren’t the 76ers, whose most experienced player has been in the league six years. So Adelman is leaving the yoke of adversity upon his veterans’ shoulders. There are long-running, firm characteristics associated with Adelman’s persona — the corner offense, the tight internal bond with players, love for family, the sometimes-grumpy external appearance. But different coaches tailor their leash length to different groups with varying degrees of control or letting-go. And it appears, at this point in the season, the Timberwolves bear plenty of the responsibility. Before Wednesday night, Minnesota hadn’t, going 1-5 in the second games of back-to-backs. The Timberwolves won consecutive games for the first time since Nov. 10 and are now saddled with a three-game road swing against San Antonio, Memphis and Boston that threatens to perpetuate their up-and-down trend. The goal, Love said, is to remain around .500 until the New Year, when the schedule weakens — the Timberwolves’ five second-night, back-to-back defeats have come against Cleveland, the Clippers twice, Houston and Oklahoma City. Yet those are the kind of organizations Minnesota must figure out how to top, at some point, if it hopes to snap its nine-year playoff drought. And while Adelman rightly ranks as a basketball mastermind, much of that determination will be left up to his athletes. Stretch-Pek: Don’t expect Nikola Pekovic to always step out and knock down jumpers like he did Wednesday. But don’t be surprised when he does, either, he cautioned, tongue firmly in cheek. “That’s my secret weapon,” Pekovic grinned. Pekovic hit from 16 feet in the first quarter and 11 in the fourth against Philadelphia, the second part of a 10-0 run that put the Timberwolves firmly in control. He’s 8-for-28 from outside the paint this season but can step out and hit from mid-range during practice, according to Adelman and his players. It’s something Pekovic said he’s tried to emphasize in his fourth NBA season. But as long as he’s in the league, the 6-foot-11, 285-pound Montenegrin is going to be an interior force. Of his 272 field-goal attempts this season, 239 have come from under or directly around the basket. Not exactly befitting the modern-day stretch five. What about a 3-pointer or two? “Don’t get too carried away,” Love said with a smile. All-Star update: Love and Rubio followers have some work to do if they hope to see either start for the Western Conference in the 2014 NBA All-Star game. Love — who right now is an All-Star lock whether he’s voted in as a starter or not — ranks fourth among West frontcourt players behind Kevin Durant, Dwight Howard and Blake Griffin with 275,506 votes. Rubio is even further behind, with seven players ahead of him on the backcourt ballot. Fans vote for three frontcourt starters and two guards for each conference, while the All-Star Game coaches select reserves. Balloting concludes Monday, Jan. 20, and starters will be announced starting at 6 p.m. Thursday, Jan. 23 on TNT. The All-Star Game is Feb. 16 at New Orleans Arena.